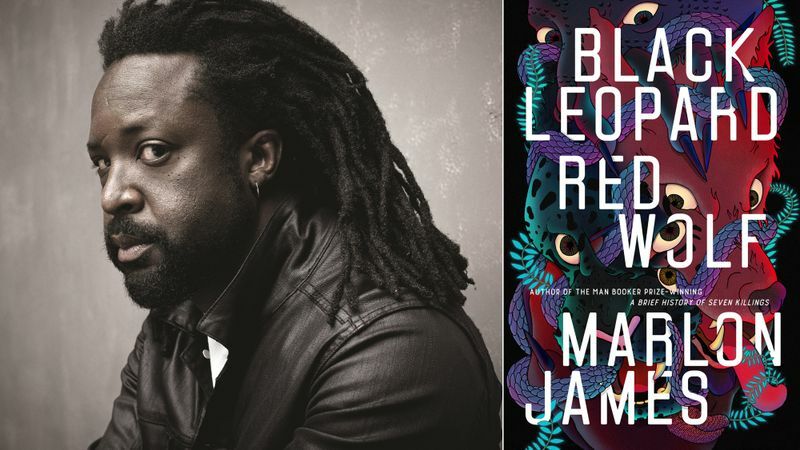 Marlon James is increasingly preoccupied by legacy. He got one from Neil Gaiman instead. Image: Reverse of galley copy. Marlon James is burdened by the absent present of a history erased. Marlon James is charmingly self-deprecating. Marlon James exchanges emails with George RR Martin. Black Leopard, Red Wolf has been hailed “an African Game of Thrones” and “the most talked about book of the year” striking gold as a hotly anticipated first-instalment and a ground-breaking genre novel for the Booker prize-winning author of A Brief History of Seven Killings. James’ next project was always destined to be big. And it’s not only that. It’s brutal too. 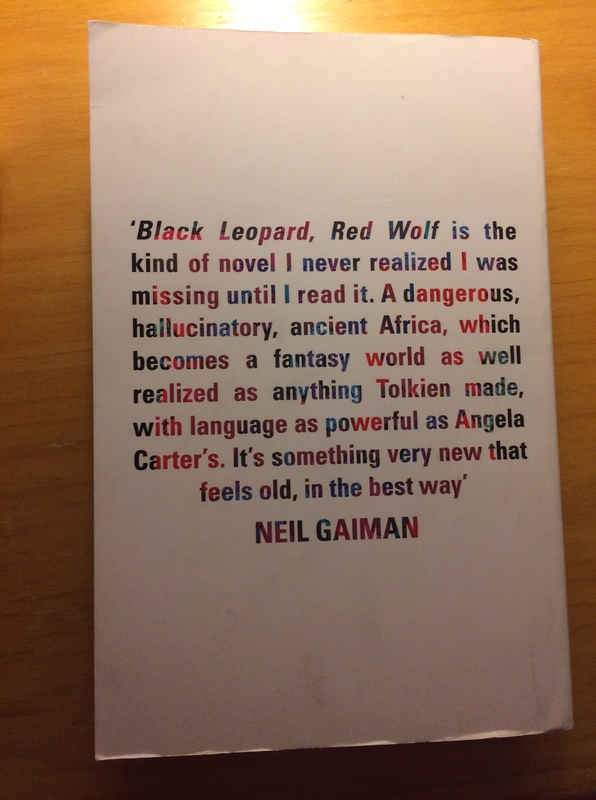 A fantastical romp across rumour and legend, language and myth-making, Black Leopard, Red Wolf captures something of the agony of the young man James recalls being, coming of age without the mythology of Robin Hood and King Arthur that undergirds regional identities in places like Britain. 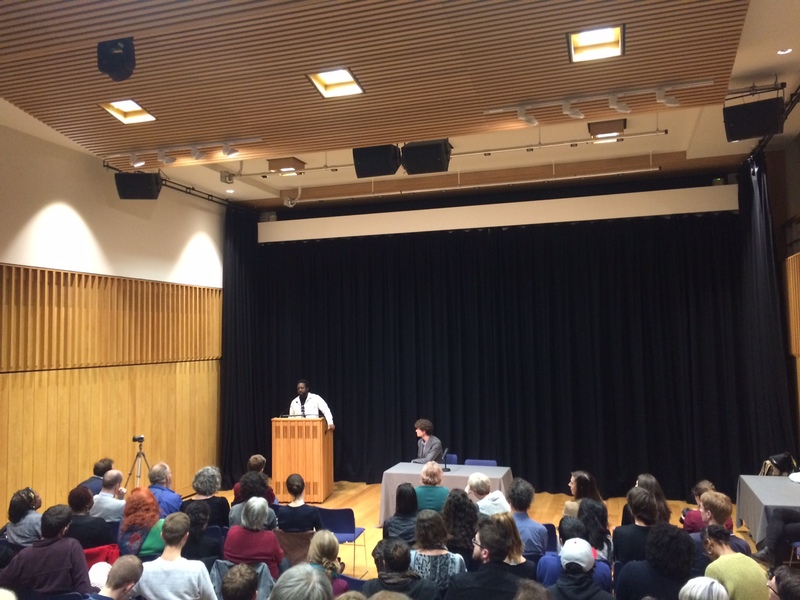 Marlon James away in the distance, embarking on a tale of reading, writing and myth-making at Pembroke College, Oxford. Standing before a crowded auditorium in Oxford in late February, Marlon James delivered the seventh annual Tolkien Lecture on Fantasy Literature, titled ‘Our Myths, Our Selves.’ In his other life James is a lecturer in literature and creative writing in Minnesota, so he’s accustomed to large groups of attentive listeners. They aren’t always this varied in age however. Looking across the auditorium, I note that I lower the average age of the audience by a couple years. James’ lecture is pitched just right, however. Referencing Tolkien’s service in WWI, he notes the irreversible damage that trauma of that nature has upon a person. “Men like him ran out of language, ran out of imagery.” It is at this very death bed of imagination at the hands of great trauma that genre fiction comes to bear upon the author. “We need genre fiction to deal with the difficult parts of life we don’t know how to deal with,” James says. “I never liked the term ‘genre’,” he notes, laughing at the notion of graduating to genre fiction when most ‘literary’ authors work the other way, as though literary fiction were not a genre in its own right. He is derisive of the presumption that one kind of literature is better than another. He still feels as though other authors think he’s ‘slumming’. 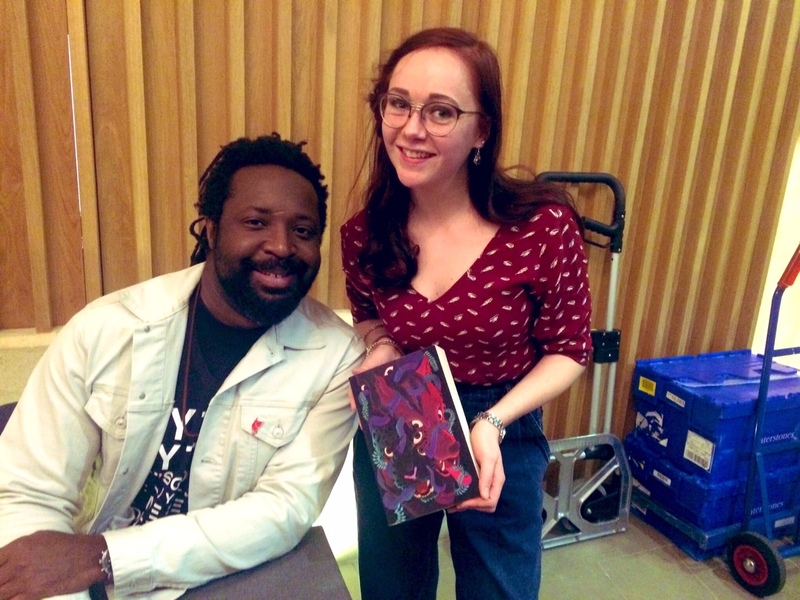 Marlon James is far less serious off-camera. Nothing could be further from the truth. On the back of a friendly argument and a disagreement about Tolkien, James has embarked on a three-part rollercoaster ride, beginning with the harrowing tale of one man and a quest, a fellowship, tribal warfare, and a missing child. The novel is dark and challenging, as bloody as any orc feast and strewn with the vampires and flesh-eaters that failed to make the crossing to Europe and still linger in the lesser-known fireside tales of things that go bump in the night. Marlon James is partial to things that go bump in the night. Researching the trilogy took James to Ethiopia, to places where he admits he had not expected to find sophistication. “But I did,” he notes, and the complex histories of people across Eastern Africa come to bear on this first instalment, challenging, the author notes, even his own misconceptions of a primitive Africa. ‘It was two years before I wrote a single word,’ James notes, and the wait has been worth it, the novel bursting with mythological detail, rich in a language bent to the author’s will. Reading it, one must simply give oneself up to James’ new syntactic prose, allowing meaning to be produced through impression as much as through structure and formal comprehension. James has sought to articulate ‘new old legends’ in a world where African mythology as it is known in the West is dominated by Anansi and the Tokoloshe. His generic ambiguity, while implicitly fantasy, ranges across horror, adventure, and queer romance. The role of trauma in this novel cannot be understated, and James’ treatment of lust and love in conflict is sympathetic and harrowing. The dialogue carries all the power of his previous novels, reminding the reader that James is as much a master of the art of conversation as he is of world-building. Chelsea Haith is a DPhil candidate at the University of Oxford. She has worked in the South African small magazine and publishing industries and her current research interests include speculative fiction, urban studies, life writing, and global literatures. She is a Mandela Rhodes Scholar, and is a 2018-2019 Associate Reviews Editor at Africa in Words.